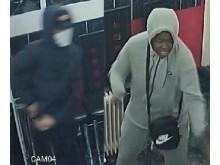 Detectives have issued CCTV images of two men they want to identify and trace in connection with a stabbing. Police were called at 1500hrs on Thursday, 11 October, to a commercial premises in Globe Road, Bethnal Green where a man had been attacked. At the scene a 33-year-old man had suffered stab wounds to his back and his arm. The injured male was taken to hospital with injuries that were not life threatening. Officers are keen to hear from anyone who can identify the two men pictured. Detective Constable Ben Stone of Central East CID said: “This was a violent planned attack, and it was mere luck that the victim wasn’t more seriously, or even fatally, injured. “I urge anyone who can name these men to contact police without delay." Anyone with information should call Central East Command Unit by dialling 101 quoting CAD4615/11OCT, Tweet @MetCC or call Crimestoppers anonymously on 0800 555 111.